Kodak AZ901 90x zoom camera is finally available at B and H store and amazon.com. The Kodak 90X Astro zoom camera was announced back on January 2016 at CES event, the camera features world largest compact zoom lens of 90x. Even bigger than the current Nikon 83X optical Zoom Camera Nikon P900. The camera features at 20 Megapixel 1 / 2.3 inch BSI CMOS sensor, you also get a variable tilting LCD display monitor and electronic viewfinder. The camera records full HD videos 30 frames per second and the bigh ISO range of the camera goes up to 3200. The 90x optical zoom lens also have optical image stabilization system, you also get built-in Wi-Fi support for wireless image transfer as well as raw recording support is also available with this camera. The camera is available at $449. B and H store and amazon.com. We have told you on August 7th, 2016 that according to Anonymous source (the same source who shared LX200 details) the FZ2000 announcement is 6 to 8 weeks away. With AF camera can shoot upto 7 frames per second with continuous AF support, the FZ2000 can shoot 4K video @ 30 frames per second and Full HD Videos at 60 fps. We have told you already that Canon is expected to announce one more fullframe lens this summer finally we got confirmation that Canon 70 -300 IS MM lens is coming soon for full frame cameras the official announcement is expected the before August 2016 however we don’t have any confirmed date now. So we have to wait till then however, Nikon may also announced 70 to 300 mm lens with VR II lens just before photo cleaner 2016. Also take a look at the list of Canon Upcoming Cameras 2016. stay with us and we will update you soon as we get ant new information. 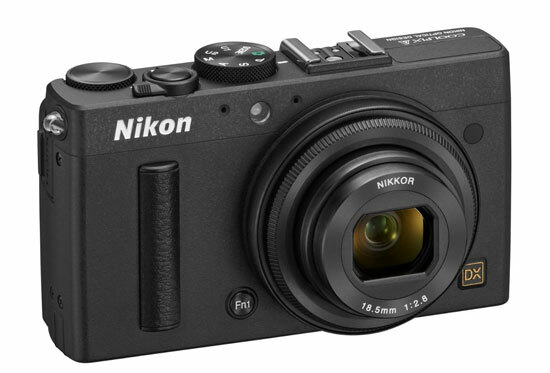 Nikon announced today announced three new long-zoom COOLPIX cameras. They include a simplified way to transfer and share images using compatible smart devices with an “always on” Bluetooth connection that makes automatic upload of images possible. 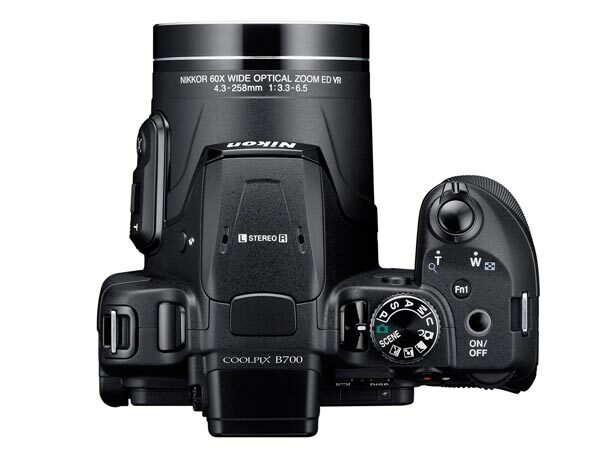 The COOLPIX B700 is a compact superzoom camera with a 20.3-megapixel BSI CMOS sensor for impressive shooting, even in low-light, and 60x optical zoom (120x with Dynamic Fine Zoom). It supports 4K UHD video at 30p. The COOLPIX B500 is a long-zoom camera conveniently powered by AA batteries and features a 16-megapixel BSI CMOS sensor with 40x optical zoom (80x with Dynamic Fine Zoom). It supports Full HD 1080p video. 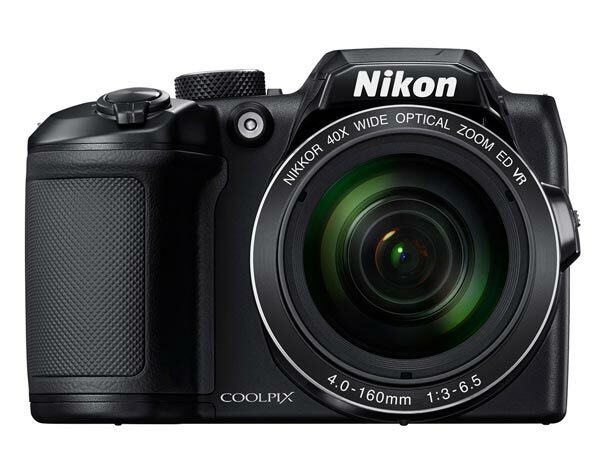 The COOLPIX A900 is a slim long-zoom compact camera ideal for travel, with a 20-megapixel BSI CMOS sensor and 35x optical zoom (70x with Dynamic Fine Zoom). It supports 4K UHD video at 30p and includes a 3-inch tilting high resolution LCD display for shooting images from any angle. StrategicAmpersand runs a full product evaluation program for current Nikon cameras that includes HD-SLRs, DSLRs, Nikon 1 advanced interchangeable lens cameras, COOLPIX cameras, and Nikon’s range of FX, DX and 1 NIKKOR lenses. If you’d like to review any of these products, please contact us to arrange a three-week product loan. In 2016 we will see bunch of new camera coming on 2016, the biggest camera in the list is Nikon D5 but the recently published pro compacts camera list is craving our attention. We are sure Nikon will also upgrade its APS-C sensor based compact camera this year with a 24 Megapixel DX format sensor and variable zoom lens, stay with us and we will update you soon as we get any new information..
Nikon P900 videos… take a look at one more demo..
Until now the SX60 HS was one best zoom camera available, but the after announcement of the Nikon P900 everything changed.. the P900 features 83.3X optical zoom that will create a Jaw dropping experience for the photographer… now take a look at the specification comparison review below..
Nikon COOLPIX P900 vs. Canon Power Shot SX60 HS Specification Comparison Table. 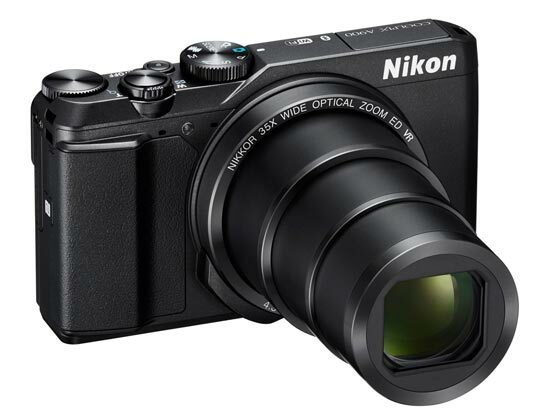 The Nikon P900 features 83X optical zoom lens, that’s is approx 18X more optical zoom than the Canon SX60 HS. 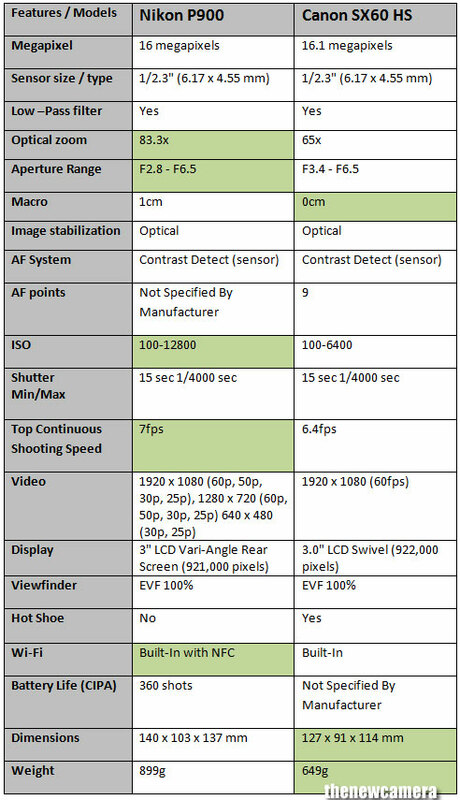 Both the sensor have same resolution and same size, but the ISO range of the Nikon P900 is 1-stop more than the Canon SX60 HS.. so we will get clear low-light images compared to the Canon SX60 HS camera. The other Nikon P600 advantage is bright aperture based lens, so at the end we are sure that Nikon P900 will give more cleaner images than Canon SX60 HS. The Nikon P900 features bit more fast continuous shooting speed than the Canon SX60 HS. Both camera can record Full HD videos at 60fps so no difference here, on the rear side they both have almost same type of display unit and EVF. Both camera comes with built-in WiFi connectivity, but only Nikon P900 features NFC connectivity inside it, so you can also use smartphone with Nikon P900 camera for remote shooting purpose. Verdict: We highly recommend you to buy Nikon P900 camera, the camera features more optical zoom lens, more ISO range and better aperture range.